Pete phoned to say that he and Lorraine were safely home again after a hairy flight home. He and Lorraine seem to have had a really wonderful holiday, enjoying the holiday and the company. At 2.30ish we went across the road to Poppy and Ben's house, and met three of Ben's brothers, their wives and niece. Poppy made a wonderful dish of meat cooked in spinach and lots of different herbs to eat on rice. Meanwhile Ben was cooking meat on the BBQ with a little help and lots of joking. Everyone was in very good spirits and the dog was having fun too. At one point one of Ben's brothers was lying on the grass soaking up the sunshine completely relaxed. He was so supple that his feet at right angles to his body were relaxed sideways onto the grass like a fish tail. If I tried to do that things in my ankles would snap! It was a lovely relaxing day and nice to meet such a cheerful group of people. Toby phoned and I heard about Meaty the cat going missing for 24 hours which frightened everyone as several local black cats have gone missing and have never been seen again. Luckily she did return safe and sound. They all had a nice time on holiday together; I am so pleased they could all get together for this. I happened to see Wynford so invited him to come over for a glass of wine and snack this evening. Mas and I got a little shopping, and I saw Poppy come home so I invited her to come over as well with Ben. They all came over about 7.30, and we spent the evening in the conservatory, and as we chatted a large apple and blackberry crumble disappeared. 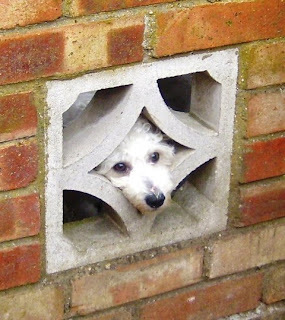 Poppy and Ben had bought Lila with them, so our cat would not come indoors, but at times he was looking timidly through his cat door at us. We had a really nice evening, and as Poppy and Ben were leaving they invited us all to come to a BBQ with them tomorrow afternoon. Our cat was miaowing piteously through the cat door as it had now begun to rain. We took some time with him reassuring him that the dog had left and things were back to normal. Unusually, he spent all night sleeping on the bed, pressed like a snake alongside my leg making me feel very hot indeed. Mas and I set off for Edgewarebury Park to collect the last of the blackberries before the season is over. We collected lots of the blackberries and about 8lbs of cooking apples in no time at all. In the afternoon I walked down to the library and while there came upon a section containing reference maps which I began looking at. I got talking to someone who said the previous week he had been walking, had walked to the edge of his map and got lost, so he was trying to find the map next in sequence. 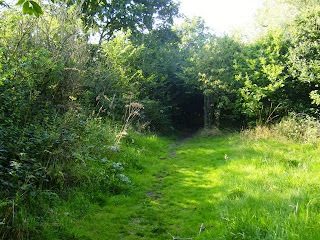 He asked me if I liked walking, and when I replied that I did, his eyes lit up hopefully, so I had to beat a hasty retreat as I do not think Mas would be keen on the idea of me walking in the wilds for hours with a stranger. Libraries seem definitely the places to meet people! In the evening I washed and cooked some of the fruit. I was so tired when I went to bed that I do not think a heard of elephants passing through would have woken me. I spoke to Diane and she sounded cheerful and busy. I did my morning chores and then went for a walk and later cut the grass in the garden. Mas set up our new video player, and having taken our old one to pieces, recovered the Battlestar Gallactica that he had been watching when it went wrong. Once set up he began to watch Battlestar Gallactica again. Today I spruced up the inside of the conservatory again by re painting it in white (not the glass bits though). I also spent some time gardening and happened to see Wynford. He told me he was 'home alone' as his family has gone off on holiday, and his Fiancee is also away. I finished off the Dan Brown book I had been reading. It held my attention all the way through, but on reflection was a bit too much like a James Bond story. I had another disturbed night as Salty and the Tabby kept pouncing on each other and rushing about. Mas went off to Watford and got the root canal done without needing to remove the tooth which we were pleased about. I felt really tired all day after having such a disturbed night last night, so when Mas came home we had a relaxing day not doing very much, me reading and Mas watching TV. Later we saw another episode of Wallender. Today Mas went off early for a blood test, and I walked to Mill Hill. Later I managed to get my mobile phone unblocked by a very helpful Carphone Warehouse sales person. We had lunch out and got shopping, and once again had a relaxed day. During the night there was another ruckus with the cats, Salty giving loud yowls, and I chased the tabby off again. The rest of the night Salty lay at the foot of the bed watching the stairs till he fell asleep, wish I could have done the same! I woke up with itching legs and saw bites all over them. These were small bright red spots, and as I put a dot of antihistamine cream on each one I counted 94 bites; I think I must have stood in an ants nest yesterday although I did not feel anything at the time. Our large rug in the sitting room has become bald in several spots, so we decided to cut off the edges leaving a better looking rectangle to put in front of the fireplace. We need this rug as bits of soot fall down from the chimney sometimes. This piece I later washed in the bath with help from Mas, and put outside to drip dry. It was a hot sunny day, so I hoped it would not take too long. Salty, in the meantime was pouncing all over the garden trying to catch flies. At one time he started plaintively calling me, so I went to see what he was up to. He had climbed to the top of our Hawthorne tree where there was an empty magpies' nest, and he was sitting in it with only his head visible above the edge of the nest, and as it was windy he was swaying backwards and forwards. I ran off to get my camera as it would have made a funny shot, but he climbed down before I could take it. In the evening a lot of apples were prepared and frozen away, and an apple crumble made. I had another bad night's sleep as cats were running about the house from time to time banging into things downstairs until I chased the tabby out a few times. Who said having a cat was relaxing? I went off to Edgware to the library and bank, and Mas went off and collected lots of shopping. Walking down Station Road I noticed that The Brothers restaurant has closed down again. We spent many hours in the Brothers when the original brothers owned this restaurant, years ago, drinking very good coffee or their excellent house wine and eating huge baked potatoes. We were invited round to Poppy and Ben's for coffee, so we went about 4.30 in the afternoon and spent a long time talking, playing with Lila and drinking coffee and eating an apple crumble straight out of the oven. We reluctantly dragged ourselves away, and home, across the road. 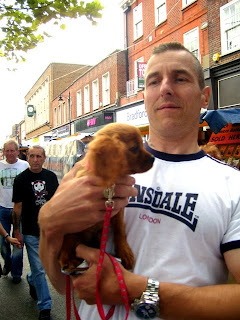 Today we set off to St. Albans and got our groceries; this young King Charles Spaniel was attracting a lot of attention; especially from the children. Once we had our shopping we drove off to Tania and Robert's for lunch. Tania had made a delicious meal with very tender lamb, and a light dessert. Tania wanted to show us the area in which she had been working, taking care of people around Great Gaddesdon in Hertfordshire. 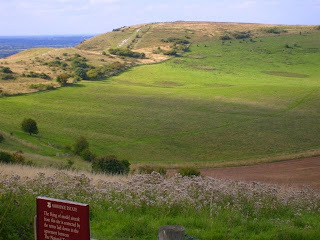 We drove first to Ivinghoe Beacon which is a prominent landmark in the Chiltern Hills, and site of an iron age fort, and as the name suggests has been used as a beacon. While we were in the area we noticed an apple tree covered in apples and decided to gather some to make apple pies. We found the best method was to shake the apples out of the tree. We gathered them up, with a lot of banter from Robert, quickly and went back to the car. 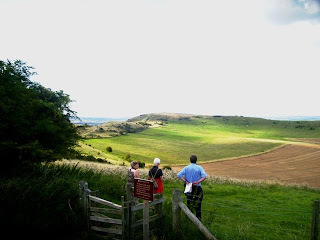 During this time Mas had been chatting to a group of people, and when we came back he was not there, and Tania immediately thought they had taken him away; he was looking at a huge white carving of a lion cut out of the side of one of the hills, and gliders drifting silently around another hill. We drove through Great Gaddesdon, admiring some of the Tudor architecture, and also Little Gaddesdon; it felt really refreshing to see so much of the beautiful countryside with rolling hill. Eventually we returned to Tania and Robert's place for tea and ginger cake, and she gave me some of the herbs from her garden. We drove home through golden evening sunshine, and had a warm welcome from Salty when we got back. We had hoped Mas could get his tooth fixed today, but he was not able to get a 2 hour appointment for another six days. I went off to Brent Cross shopping centre by bus today as I prefer to take a bus rather than drive if possible. I was shocked to see, as we passed Kingsbury, that The Red Lion pub (built 1839) was no longer there, and it looked as if apartments were being constructed there to replace it. Further along the road I saw that The Welsh Harp pub now seems to be an eatery. Once at the shopping centre I bought some underwear and a new swim hat and returned home on the bus. After Mas and I had dinner Poppy and Ben called round, and we had coffee and chatted for some time. While we were talking in the dining room the Tabby cat came into the kitchen, and while we watched him he ate Salty's food; Salty was standing nearby rather timidly looking at us! Today was Mason's birthday, and the new video player was delivered. We had lunch at the Man in the Moon, although I had suggested going somewhere different, but nevertheless we had a nice lunch and a relaxed day. When we went to bed we did not leave any cat food out for the cats, especially if the Tabby is eating it every night. Mas got bad toothache today, and had to keep taking paracetamol. 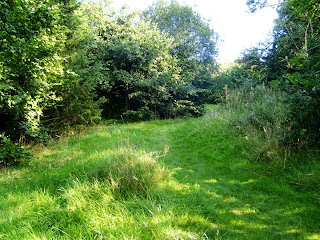 In the afternoon we went back to Edgwarebury Park and walked down to the Watling Community Forest that had been planted a few years ago. We were happy to see it is thriving. When we got home Mas spent ages trying to sort out an appointment with the specialist in Watford to have the root canal done. After breakfast the postman brought Peter's birthday card to Mas, which Mas thought very funny and appropriate (rudeness I call it). Mas drove off to our dentist to pick up the referral letter, then off to find the other dentist, which is not easy to do, and had to have another dental examination. It transpires that he will have to wait a week for a two hour slot, despite the pain. When Mas got home he gave me a Dan Brown book called Deception Point which the dentist had given to him for me! In the evening we watched Agatha Christie's Hickory Dickory Dock with David Suchet as Poirot. After this Mas watched The Guardian with Simon Baker. The tabby cat came into the sitting room while Mas was watching this, but ran out again when he saw Mas. While Mas was on the computer I cut the grass in the front and back garden, and later walked down to Edgware, and looked at the new 99p store that has moved into the shop where Woolworths used to be. Walking back through the park I looked for the tree that Poppy had been getting plums from. I found a damson tree and nonchalantly gathered some of the plums, in spite of the 'are you mad!' looks that some other walkers were giving me. In the evening I made some damson jam. Today Mas and I went to the Man in the Moon and had a really nice roast dinner, then got some shopping. We went home and put away the shopping before going to Edgwarbury Park to see if the crab apples were ripe. I was surprised to see that a wild flower meadow has been created, and some dead trees that were originally street trees have been dug up and planted in the meadow to provide a habitat for birds, bats and food for beetles. Wildflower seeds were planted around the trees in the hope that they would spread. The crab apples were not ripe yet, so we picked enough blackberries to make a crumble for the evening, and tomorrow. Despite it being very hot, Mas and I went blackberrying in Stanmore in the afternoon where we used to go, and unusually we saw another couple gathering fruit too. Later I made 10lbs of jam, and did a little gardening. We watched New Tricks in the evening. During the night Salty ran into the bedroom, and hid behind the curtains on the window ledge. After a while he ran onto my bed and lay by my side, with his head by my feet watching the landing; he seemed rather frightened. Eventually he went to sleep. I am still not quite sure about his friend the tabby cat. Today Mas went off to the dentist, and while he was out I finished off the last bit of painting in the kitchen then re potted the small parsley plant I had bought, and collected all the Honesty seeds from the plants in the garden and generally pottered around till Mas came back home; the dentist was not sure if Mason's filling would do, or whether he would have to have a root canal treatment. In the evening we watched an NCIS, and I spent time playing with Salty, then he went outside and played with the tabby cat; this cat is getting very bold, and is openly trying to come in while we watch TV. Salty, unusually, also spent part of the night sleeping beside Mas instead of romping about outside all night. I had a routine appointment with my doctor and then walked home. Mas and I had planned to have lunch at the Man in the Moon and get some shopping, but when I reached home Margaret phoned and asked if I would like to go blackberrying with her and John. I left quickly after finding some plastic boxes to put the blackberries in in and went round to their house. We walked over to Arches field, and they showed me their favourite picking place. The weather was hot and sunny, and in short order we had picked enough to fill all our boxes, and having displaced a wasps nest we went home. I invited them to come for lunch with us, so we all drove off in John's car to Stanmore. We had a cheery lunch together, and then collected shopping. We had caught the sun a little getting the blackberries, and all felt quite sleepy. They dropped us home before driving to their house. In the evening I froze about 8lbs of blackberries and made jam with the rest. Today I finished off the curtains, and re hung them which was the worst part of the job, and involved me screwing my neck around like the child from 'The Exorcist'. That job done, I tidied and vacuumed as there were cotton threads all over the house, and hoped my neck would return to normal before too long. Mas has got bad toothache which sends pain along the jaw and up into his temple, but he has to wait for his dental appointment on Friday so is taking paracetamol every four hours. We watched Simon Baker (who is also in The Mentalist) in The Guardian. After that I washed up and played with Salty and left Mas to watch Numbers. I spoke to Pete today, and went down to Edgware later to get shopping. I saw Ben fixing his gate so stopped to chat while Lila watched us from the garden. Mas spent some time trying to fix our video player, and worked on the computer. I did some gardening, and planted the rhubarb root that Tania had given us. Later I made dinner making stuffed peppers so that I could use lots of parsley (if it was good enough for the Romans it is good enough for me, and I don't go along with the quote " parsley is ghastly"), mint and Bulgar wheat. Poppy and Ben called round with Lila, chatted and had a coffee and I managed to get these photos despite Lila getting bouncy and excitable; she is a lovely dog. Later we watched a Taggart before going to bed. We went off to St.Albans, got lots of shopping from the market and had a nice lunch at Sazio's. We did not meet up with Tania and Robert as they could not make it today. Both of us felt really tired , so we went home without wandering around as we like to do, looking at things. 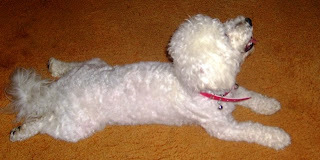 We watched an NCIS in the evening; our video recorder does not work at the moment, so we do not have too many choices. It is nice being able to listen to my choice of music on Spotify while I do things upstairs, so I am being more productive. Mas went off to a DIY shop this morning, and I decided to give my hair a treat by mashing up an over ripe avocado pear, and massaging it all into my hair...what a messy business. I kept it on for half an hour and just rinsed it off when Monika phoned. She was worried in case Milan had Swine Flu as he was ill, and they were flying off tomorrow. I went over the road to Poppy, and she phoned Monika back and it was decided he did not have the flu. 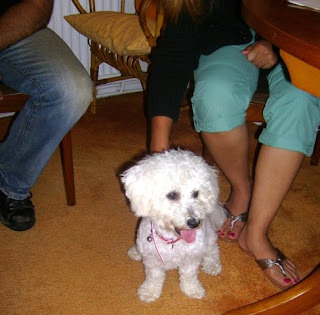 I was surprised to see that Poppy and Ben had acquired a lovely white poodle puppy; they collected it yesterday, but she seemed completely settled in already and was obviously happy with her new family and home. We did some gardening, and I cut the grass and Mas tied back the roses round the window which we had untied for the glass men. 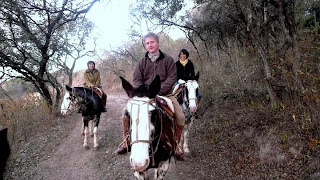 Toby phoned and talked of his holiday in Argentina which sounded wonderful, and he sent lots of photos too. In the evening we watched The no.1 Ladies Detective Agency and a film called Mermaid with Cher in it which was interesting, but made me feel like shaking Cher's character and that of her daughter from time to time. We waited for the men to come and fix the conservatory window, but they did not come! I finished my library book The Memory Keeper's Daughter; It was certainly a page turner, but I did not really like it. Most of the day Mas and I spent doing things that had to be done, but took a break to watch Pie in the Sky. We went to bed early as Mas had an appointment with the dentist bright and early as he had been having pain along his jaw. I set my ancient alarm clock that has to lie face upwards on the floor otherwise it stops. Just as I was going to sleep Salty came upstairs and chewed the clock for a while before going to sleep curled around it, so I had to carefully check that he had not pressed the alarm off. Mas went off to the dentist early, but has to wait a week for a filling and has to take painkillers! Four men arrived to fit the new glass panel, one to watch from upstairs, one to do the work on the conservatory roof, and two to carry the glass. They were a likable bunch, and one explained that if he was on the roof he would fall through it, and he showed me grazed arms as evidence of a former fall. In no time they finished the work and left. Mas and I felt like celebrating, but instead he had to dash off for a doctor's appointment. We watched Pie in the Sky, then had a candlelit dinner, music and a glass of wine. I went to The Royal Free Hospital again and was reading my library book on the train, almost missing my station, and having to gallop off in an undignified rush. All went well when I saw the doctor. I just got home in time to watch a 'Monk' with Mas, and then I had time to catch up with a few emails, and also speak to Diane who enjoyed her holiday in France. Today is very humid, but I managed to hang one curtain that I had lengthened from the top, and luckily the pelmet covers the join so it is not seen. Now for curtain 2! 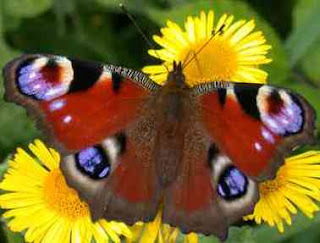 I did some gardening, and saw a beautiful peacock butterfly, but was sad as part of one wing was missing. I managed to pick some of the greengage plums that grow in our garden, and ended up with a bowl full, but some dropped down into an inaccessible place. For a change I made Tabbouleh which uses Bulgar wheat, tomatoes, onion, lots of parsley, mint, olive oil and lemon juice. The recipe said "The bulgar wheat should be a lesser player in this salad, like 30 sheep in an acre of forest, so to speak". I have been looking for ways to use parsley and mint. I tried it on Mas and he liked it; it is strange how the flavours combine and none is dominant. Afterwards we watched a new 'Midsomer Murder', and uncharacteristically they are getting quite gruesome lately. When we got up we watched Salty romping on the grass with the Tabby, and then they began chasing each other in circles. Clearly they are friends which is a relief. Later we did some gardening to keep the place from being swamped by a tsunami of vegetation, and we both tried to catch up on various things that we had been putting off. Toby phoned talking about the wonderful holiday they had in Argentina which was very cheering. Today I had to go to the Royal Free Hospital for a blood test, and afterwards walking up the hill towards Hampstead in the sunshine I felt really happy. It also seemed comforting to know that my grandparents, parents and aunties would have also walked up this street many times, looking at the same architecture, although the use of the various shops has changed. Florence phoned, and I called Pete to see how he was. In the evening we watched a Wallender. Mas went to hospital today. While he was out the glass man came round and measured the broken panel. When questioned he said he had no idea when it could be done as the man who was to do it was in hospital having a hip replacement! And so it goes..........! I washed the sitting room curtains, and when they were dried and pressed I re hung them, only to find that they had shrunk about 10" and were no longer ceiling to floor curtains! I had a cheerful email from Toby saying he had had his best holiday. In the evening we watched an NCIS, only interrupted by the grinding of my teeth when I thought about the curtains. Today I walked to the library, leaving Mas contacting different glass men. In the library I was looking for a particular author, but a man was sitting in the corner talking loudly in Italian and then in Russian. I had to practically lean on him trying to look for my book. Another man was also trying to see round him, and then he suddenly handed me a book and became very excited, saying I must read it as it was so good. It is called The Memory Keeper's Daughter by Kim Edwards, a best seller ion America, then he rushed off to find another and handed me Child 44 by Tom Rob Smith. Neither of these books appealed to me as I get anxious reading about bad things that happen to children. In return I pressed Doris Lessing's Briefing for a Descent into Hell on him, and went home. I began the first book, and found it to be a real page turner. I got an email from Christian saying he had got peritonitis recently and had been in hospital, and luckily was treated in time. Teeth have got a lot to answer for! Mas and I watched an old Pink Panther film, then an NCIS before bed.